After five successful years as the Dubai Tour and the Abu Dhabi Tour merge into the the brand new, combined, UAE Tour. The only WorldTour race in the Middle East, organized by Dubai Sports Council, Abu Dhabi Sports Council, Sharjah Sports Council, in partnership with RCS Sport, is scheduled from 24th February to 2nd March 2019. The inaugural UAE Tour’s seven stages will embrace all seven United Emirates. 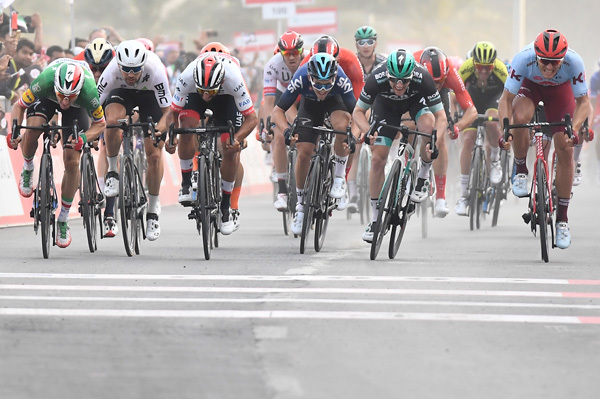 The first three stages will be hosted by Abu Dhabi, the fourth by Dubai, Sharjah and Ras-al-Khaimah, the fifth stage crosses Sharjah, Ras-al-Khaimah and Fujairah, the sixth is in Ajman, Umm-al-Quwain and Ras-al-Khaimah, while the final stage sees a return to Dubai. 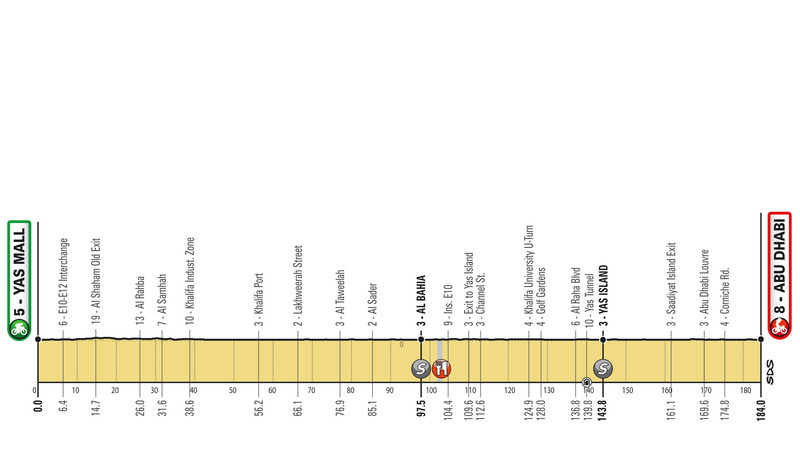 The 2019 UAE Tour has a total distance of 1,090km with a significant elevation gain of around 4,500 metres, mostly concentrated into stages three, four and six. The new race is a mix of technically different stages, open to all kind of riders, with the all-rounders most likely to win the overall General Classification category. It starts on Sunday 24th February in Abu Dhabi’s Al Hudayriat Island with the ADNOC Stage (16km), the very first (and very fast) Team Time Trial opening the Middle East WorldTour race. 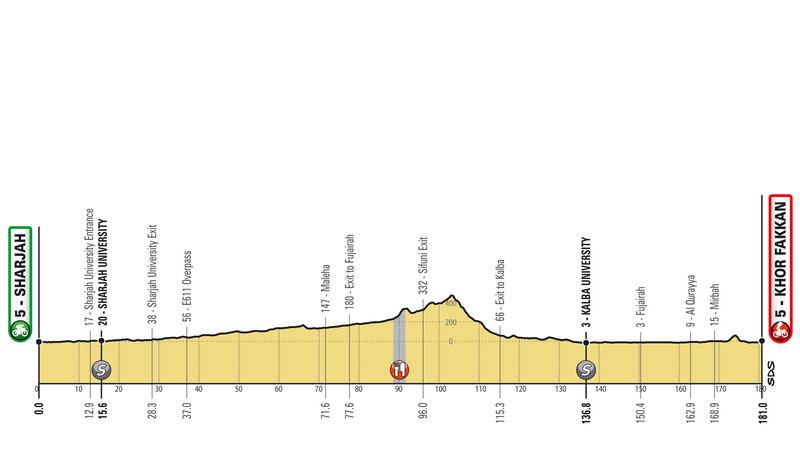 The following day, the peloton will start the Al Ain Stage (179km) from the Al Ain UAE University before facing the first UAE Tour peak: the 1,025m Jebel Hafeet, which features a maximum gradient of 11%. 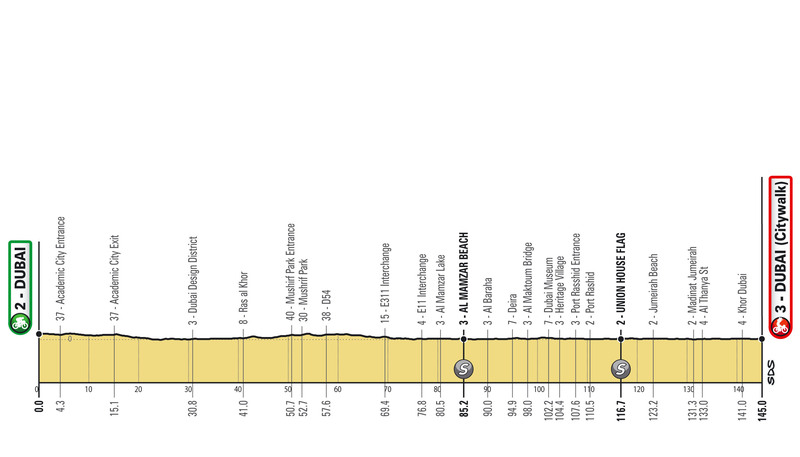 February 27th sees the fourth and longest stage of the UAE Tour, the Dubai Municipality Stage (205km). Its route is a tribute to the classic Dubai Tour “Queen stage”, starting from The Pointe - Palm Jumeirah and finishing with the short, sharp rise of Hatta Dam, climbing 200m on gradients ranging from 12% to a maximum of 17%. The next day, the Sharjah Stage (181km), runs from Flag Island to Khor Fakkan and is likely to culminate in a bunch sprint. 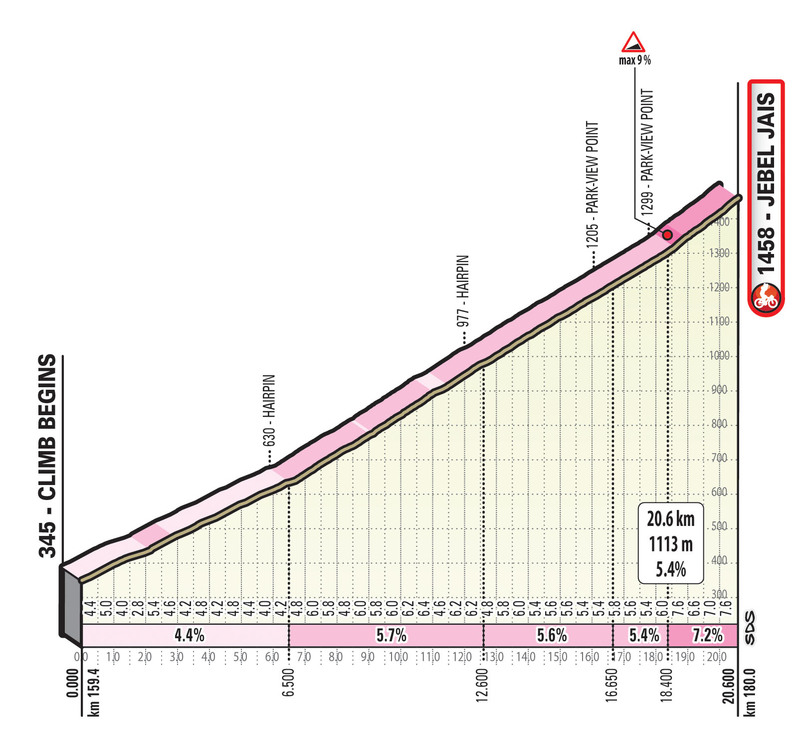 New features are packed into the sixth day, the RAK Properties Stage (180km), when, for the first time, the peloton will ride among the Jais Mountains. 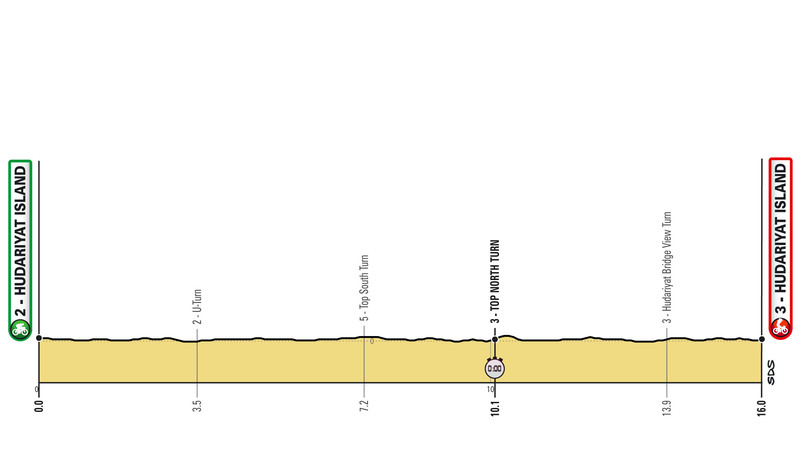 150km after km 0 in Ajman, the climbers and puncheurs will fight for general classification on the 20km-long uphill finish of Jebel Jais, with its 5% average gradients. The Grand Finale, on Saturday 2nd March, delivers a spectacular parade entirely in the city of Dubai. 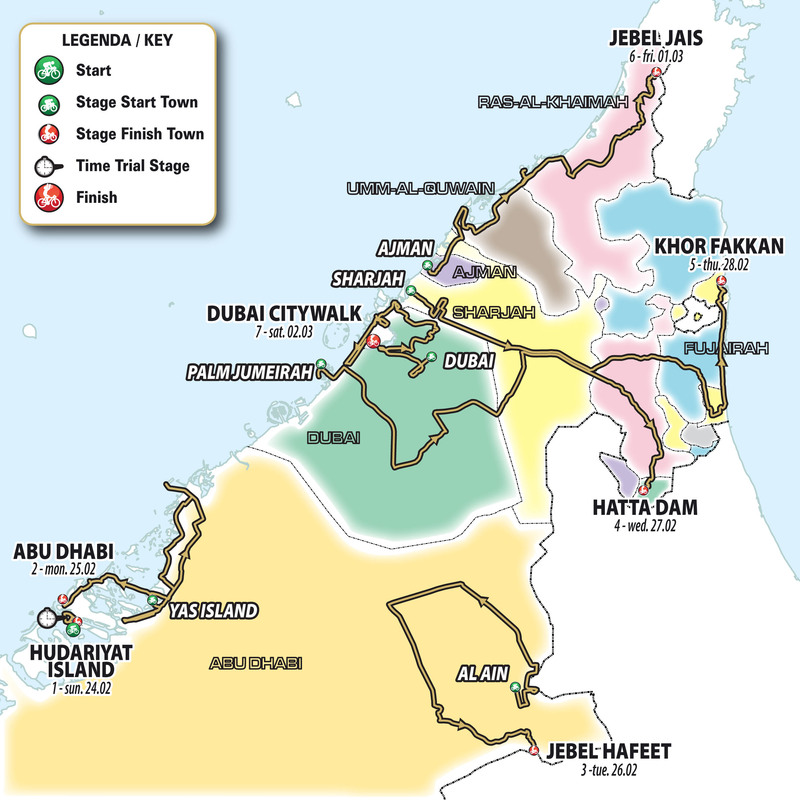 The Dubai Stage (145km) starts at Dubai Safari Park and finishes at the City Walk district with what is expected to be a bunch sprint. 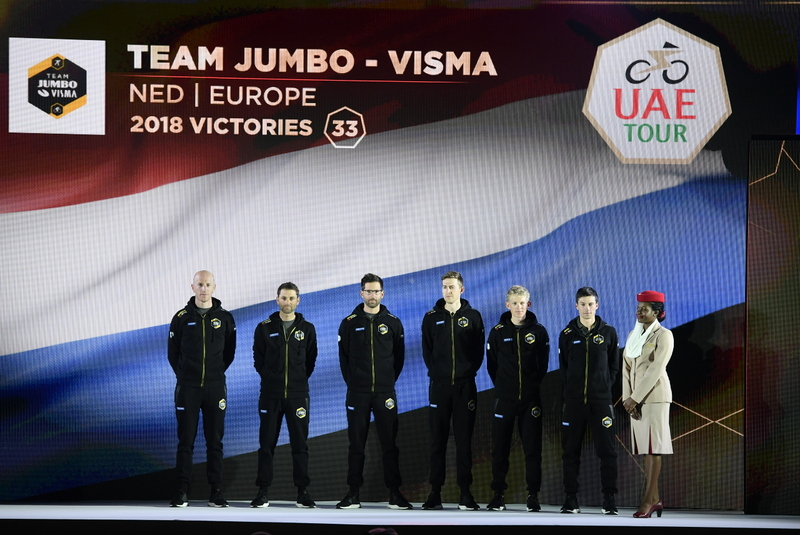 The official footage of the seven-stage UAE Tour inaugural edition will be distributed on the screens of every country of the world, thanks to the coverage granted by 13 TV networks. For the International Feed, two hours live per stage will be produced. Eurosport will broadcast live all seven stages, reaching 64 territories between Europe and the Asia Pacific area. 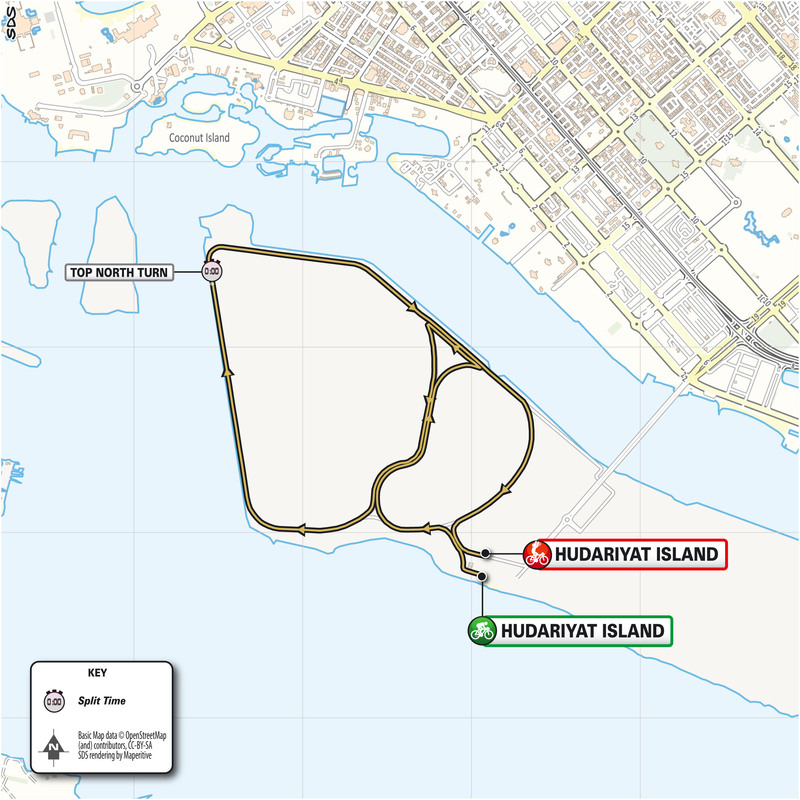 European cycling fans will be able to follow the race running through all seven emirates, mainly on Eurosport 2. Furthermore, in Europe the one and only WorldTour race in the Middle East will be shown live free-to-air on the screens of RAI Sport +HD in Italy and of La Chaîne L'Équipe in France (including DOM-TOM territories), which will enrich the coverage with on-site reports. Good chance for Sunweb to get off the mark tomorrow. It hardly feels like they have raced this season. Jumbo and possibly Bahrain as their main rivals imo. As for the course, it's not bad, but as I think I said when it was revealed, they could have done with a hilly stage à la the one Kippers won at Sharjah last year. Well Fromme has to recover from his Colombia sightseeing tour. He won't be missed. I can confirm that - it's three hours. 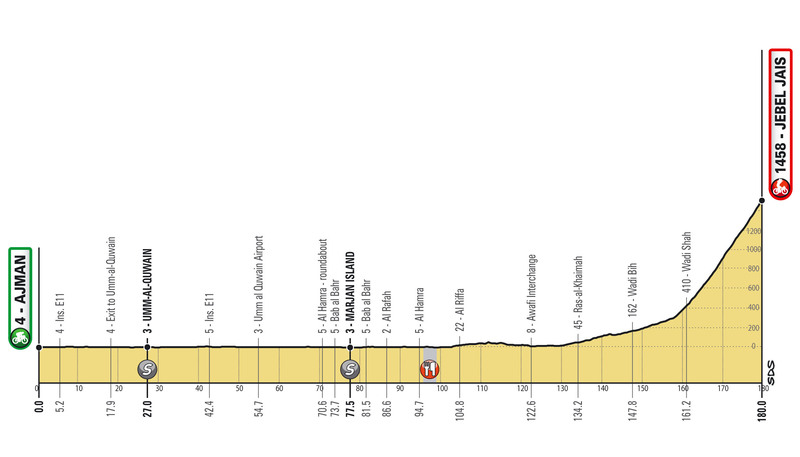 Tomorrow's TTT will also be my début on the German Eurosport/Radsport-News live-ticker. Froome may send Phil Warburton in his place. Tony Martin was dropped relatively early indeed (and finished last from the team), but Jumbo still took the win by quite a good margin. Before the race Kristoff sounded a bit worried about his leadout abilities, as he had not done one since his very early days at Katusha, but it worked out pretty well. He launched Gaviria at the right time, and no one was able to get past. “It was a very difficult sprint because there are a lot of strong riders here for sprinting. But my teammates did a really good job, notably in the crosswinds when the peloton split. At the end, I got a perfect lead-out from Kristoff. It's very important for us to win here as a team. 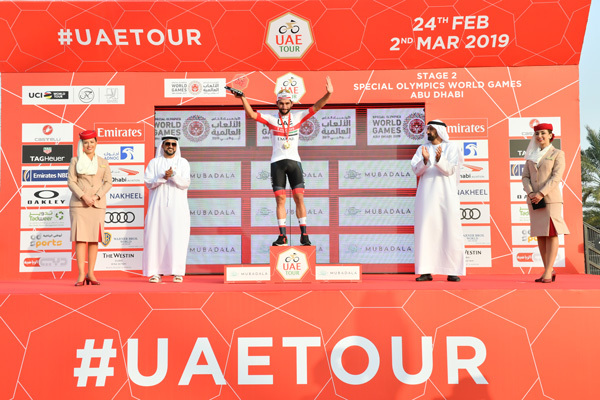 The UAE is my new home”, Gaviria said after the stage. The echelon action was decent, but as soon as the Eurosport coverage started, it was back to watching paint dry. The strange behavior award today goes to Mørkøv who didn´t notice he positioned Kristoff perfectly or forgot they´re not in anymore. On a more serious note I,think it is personally important for Kristoff that he sticks to the deals he has made, if the boss decides he will leadout, that is what he will do. He is unlikely to do an Edvald Boasson Hagen-quality effort, referring to what Hagen did in the Doha world championships - sneak away from it and ride for his own chances. Kristoff seems to hold himself to a higher standard. His feud with Hagen after Doha more or less forces him to do so. He will do all he can for his team to win the way the team wants him to. Speaking of Doha, the little Norwegian prince Aladdin still likes to play in the sand, it seems. Great to see the former U23 Kristoffer Halvorsen up there with the big boys now, as symbolized on the slow motion replay by the disappointed face of Marcel Kittel in the background as Halvorsen crossed the finish line behind Caleb Ewan. Kristoff is riding for a contract. Clearly he has to do his bit for the team at his age to stand any chance of getting good money next year. I doubt he’ll win many races this year. 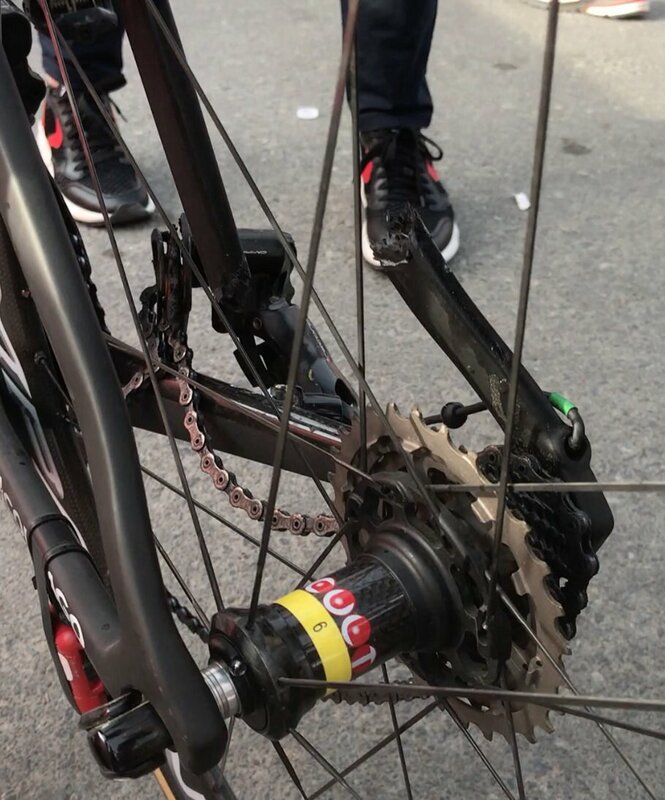 The crash was with 6 or 7k to... maybe he had some damage on the bike and changed it after chasing back? Or why would he get the same time? A mechanical problem of some sort. The question is, should there have been a 3km rule on today's finish? I'm inclined to say yes. 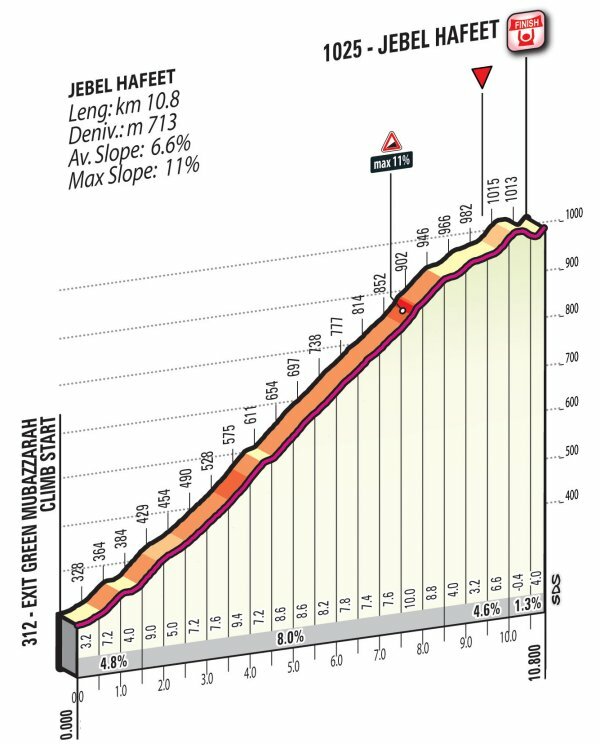 The stage does end with a climb of sorts, but sprinters were still contesting it (and winning) and the crash with 6-7km in some alternate universe could have very easily happened with less than 3km to go. Yeah, sprinting is a young mans game. He should focus on Classics. Yeah, he crashed with ~7 km to go, chased back, just got back on, and then dropped back again, for no apparent reason. The commentators speculated that the chase may have taken too much out of him. My French isn't great, so I don't quite understand what it says. Who can help? I'd better savour this moment, the first (and probably last) time I can out-language Fus. Good for Ewan to get an impressive win on the WT with his new team. After a tough year last year at Orica. 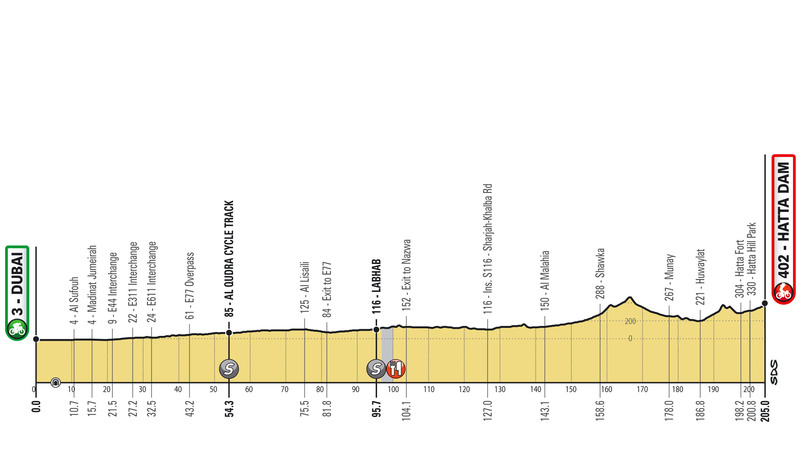 Also uphill against some of the best climbers and sprinters the WT has to offer. And with the new Mrs. and baby on the way. PS. Shocked to hear Kittel has won this stage before. He won the stage to Hatta in 2014 ... but as far as I can see, that stage finished in the town, not at the dam, so didn't include the climb. There are a couple of guys that sprint well even if they are in their 30's. There seems to be no problem with Kristoff's power, but the bike manufacturer should check if the carbon fibre lay-up patterns for the chain-stay are optimal. Back to the sprint issue, Kristoff is focused on the classics but he can still do a decent job in sprints and win a handful + contested sprint stages in a year with the right team. Last year he was often forced to close gaps on the lead-in (if I can call it that, I mean in the final, but before the lead-out). UAE just didn't have the right riders to form a train capable of keeping their sprinter and leadout man in the right position. I don't think anyone doubts Gaviria is an even faster sprinter, but it takes more than straightline speed to win a sprint. Marcel Kittel called and told me "1. you need to be there when the sprint starts 2. your legs must still be reasonably fresh for that final kick". Kristoff has a lot of this 'more' part as he has an endurance that few can match (Peter Sagan does), he is good at positioning (even if Viviani is the master of the craft) and it also seems Kristoff can sprint almost as good if his legs are made purely of crystallised lactic acid. In the extreme example from last year, Kristoff did the lead-in himself with his lead-out following his wheel, then they switched for the lead-out to lead out, and finally Kristoff did the sprint, not for a victorious result, but a good result. Winning a sprint stage is a team effort, watch Volta ao Algarve 2019 stage 4 final 10 km for the bee-train's state of the art performance, bringing Groenwegen up to an optimal sprinting position after a technical of some sort with 7 km to go. This could never happen in last year's #UAE. I don't think the team as such is very much better this year, the lead-in still lacks control of the situation but alright, with both Gaviria and Kristoff in the race, if Gaviria has a meltdown at 7 km Kristoff alone is strong enough to bring him back again - but Kristoff could also contest the sprint himself. Who's going to do the split-second decision making here? 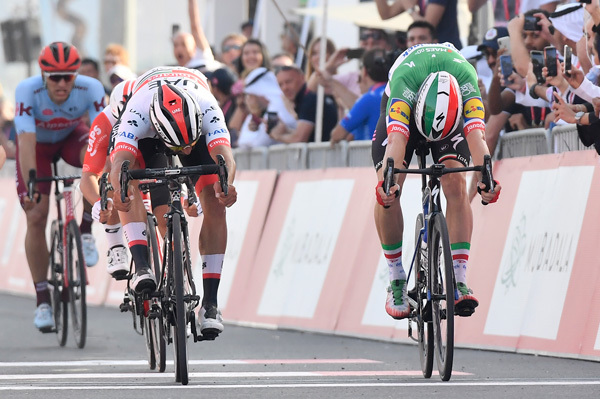 It may look good now with the Gaviria victory in the second stage of UAE tour, but they were not up against the best in the business. UAE remains a team with stellar captains and mediocre midfielders. That usually doesn't land too many victories, but it keeps them in the headlines whereever they go. It doesn't change the game much that this year, the mediocre midfielders have yet one more star to look after. Most likely they will end in 3rd position (on average), behind and : teams that work better together and that have equally fast or even faster sprinters than . One of the differences between classics decided in a sprint and stage race sprint stages is that a 2-captain setup makes more sense due to the lucky/unlucky factor being important when people start tumbling left and right and attack number 231 decides the final selection. The exception of course is the MSR where it's all about the Poggio. IMHO the team and not just Kristoff can do better in the classics than in the sprints. I like to see Kristoff giving it all for a team mate, but it limits his own opportunities, and as you say, in the classics often luck plays a factor as well - one crash at the wrong time, and you're going to miss those crucial 4 weeks of the year. He must be one of the best paid riders in cycling (at Katusha at least he was reported to earn over 1.5 million Euro a year) and I guess if he wants to come anywhere close for 2020 again, he needs to win one big race at least. Having good and loyal domestiques is crucial for a team as well, but not at that price, and if the victories don't come early, Kristoff could risk running under pressure to get a good deal. 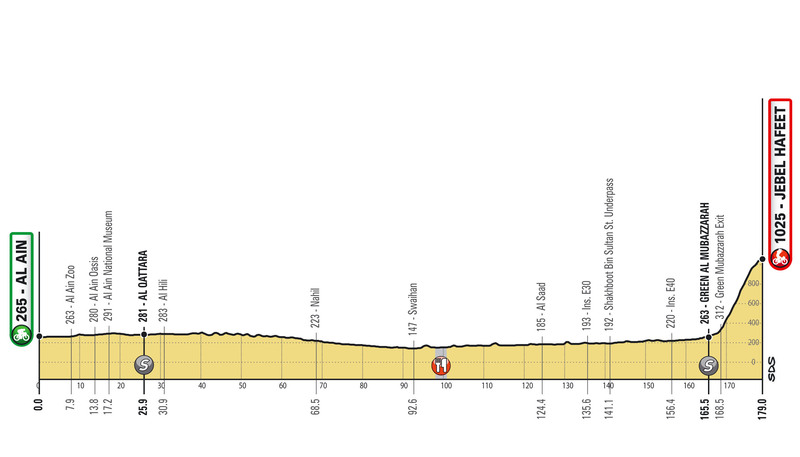 As I understand this situation, Kristoff will only be a lead-out in this race and the Tour, maybe Suisse too. for the 3rd time in 4 days, the breakaway only consisted of riders from the PCT teams, with Kuriyanov and Planet being part of it for the 4th time. With 52 points, all scored in intermediate sprints, the Russian now not only holds the intermediate sprint jersey, but also has established a healthy lead in the regular points classification, ahead of Planet (43pt) and Viviani (36pt). It's not that too many people will take note of it, but winning a points jersey in a WT race surely is not a bad achievement for a rider whose only 1st place in his career so far came from taking the youth classification in the Ain'Ternational-Rhône Alpes-Valromey Tour in 2013. Fairly long, but pretty steady. So the average wealth of spectators of this race is into 10 digits. The crowds in Rwanda seem to be enjoying it more. Talking of crowds, what of us tv and net watchers? Good performance again by Gaudu, surely FDJ have got to put him in for Paris-Nice.